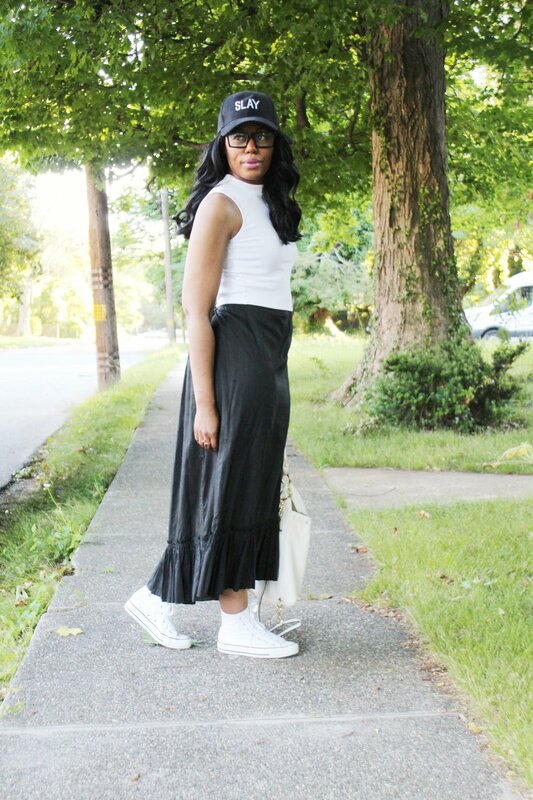 This maxi skirt has been in my wardrobe for a while and I decided to switch it up a bit by styling a tomboy chic look instead of dressing it up. I’m finding that I enjoy being casual especially during the day when I’m running errands and taking care of business, but I still want to be polished and looking casual chic. One of my favorite people who pulls off tomboy chic effortlessly is Cynthia Bailey, who use to be a supermodel (Google her) and always looks fabulous. The maxi skirt I’m wearing is black with ruffle details at the bottom and it ties in the back and comes high in the front. 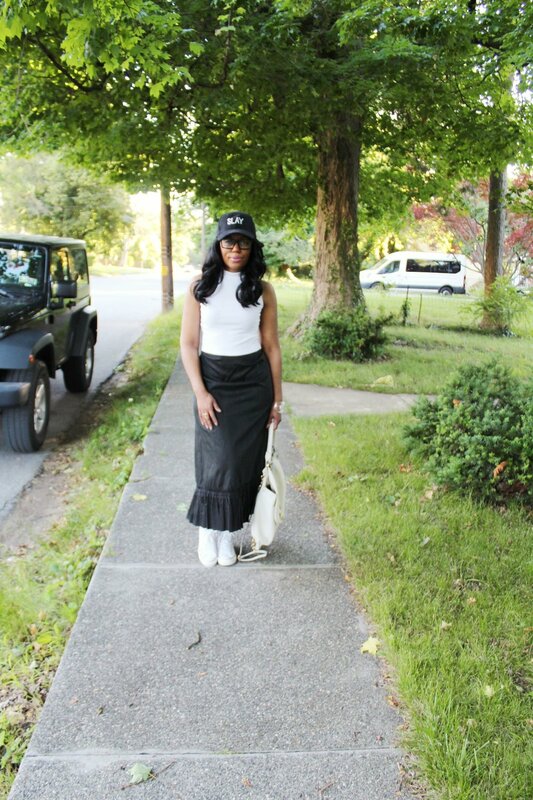 I paired a white crop sleeveless turtleneck top that balanced the length of the skirt and the fit to elongate my look. I also wore my “Slay” black baseball cap, which if you didn’t know I absolutely love hats! My white Converse high top sneakers finished this tomboy chic look with my backpack/handheld bag. This is the perfect daytime casual look, but if I wanted to switch it up for an evening event a quick change from sneakers to heels and a fedora hat and I’m good to go. This is tomboy chic made easy! 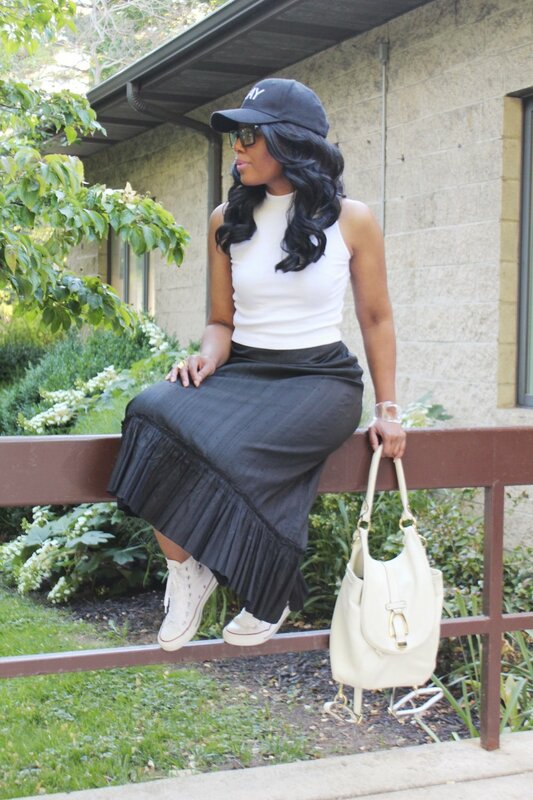 Share how you style your maxi skirt for the summer?